The news earlier this week that MySpace is acquiring Photobucket for up to $300 million highlights the importance of the widget space in general, and photo/video sharing widgets in particular. 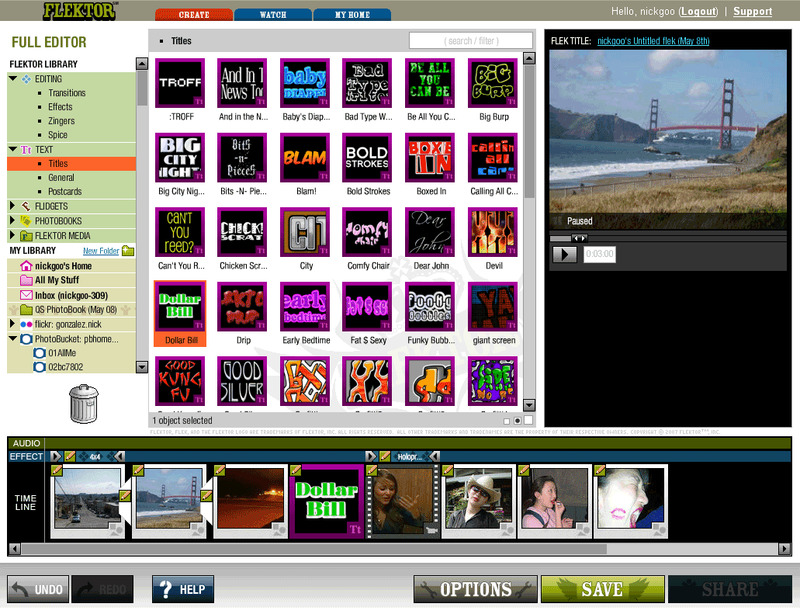 Competitors like Slide and RockYou allow users to create photo slide shows with various effects and transitions, and then embed those slide shows onto MySpace pages and other profiles. These services are growing rapidly. Newcomer Flektor wants to carve out a piece of this market for itself, and we think they have to tools to compete with these more established startups. Slide’s most recent financing, rumored to be in the $20 million range, is a reflection of this growth. According to Hitwise, they have grown by more than 2,000% in the last year. Slide tells us that they are delivering more than 150 million daily slide show views and that more than 200,000 new slides shows are created daily (a press release will be issued later today). The new kid on the slide show block is Flektor. It just recently came out of beta and has few users so far, but we’re hearing they are getting a lot of attention from potential acquirors. Flektor’s founders, Jason Rubin and Andy Gavin, previously co-founded game developer Naughty Dog (Crash Bandicoot and Jak Daxter), which was acquired by Sony Computer Entertainment in 2000. These guys are experts in creating attractive user interfaces, and Flektor is a generation ahead of Slide and RockYou in ease and flexibility in creating slide shows and related products. Like Photobucket’s recent offering, Flektor allows users to create slide shows using video, photos, text and effects/transitions, something Slide and RockYou have yet to release (Slide and RockYou also don’t do effects, which are like Photoshop filters – users eat this stuff up). In our testing we also found the Flektor creation wizard to be far easier to use than the current Slide and RockYou offerings. Click on the screen shot for a larger view. Slide and RockYou have valuations that prohibit speculative acquisitions. Flektor is brand new and doesn’t have the capitalization complications of the older startups. My bet (and rumors around the valley back this up) is they may be acquired in the next six months by one of the social networks, perhaps one of the up and comers looking for as many tools as possible to compete with MySpace.